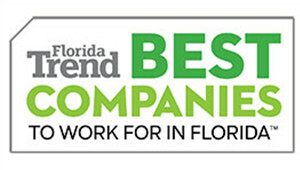 Moss Feaster was named a Best Company To Work For In Florida! The listing and award is in the August issue of Florida Trend Magazine. ﻿View the digital version of this issue. ﻿Moss Feaster ranked no. 20 in the Best Large Companies (250 or more employees) list. If you're interested in working for an award winning company in the funeral and cremation services industry, visit our Careers section for our latest job openings. Firms were divided into three groups — large companies of 250 or more U.S. employees, midsized companies of 50 to 249 U.S. employees and small companies of fewer than 50 U.S. workers. Contract employees were not included in employee surveys and not added to employee counts.